Stem cells are a hot topic in biology. Scientists call them “undifferentiated,” because they have not yet specialized to become a specific kind of cell. This means that a stem cell can develop into several different kinds of cells, depending on what the body needs. For example, everyone has stem cells in their bone marrow. Some of those cells (called hemopoietic stem cells) can develop into various kinds of blood cells, while others (called stromal stem cells) can develop into fat cells, bone cells, or cartilage cells. Physicians have used such stem cells to treat certain heart conditions1, and it is expected that as time goes on, more stem-cell-based treatments will be developed. Of course, bone marrow isn’t the only place in which stem cells reside. 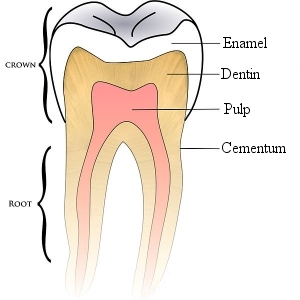 In fact, stromal stem cells can also be found in tooth pulp, the soft tissue that is under the tooth’s dentin (see the illustration above). That’s where the blood vessels and nerves of the tooth are found. While scientists have known for a long time that these stem cells are there, how they get there has always been a mystery. Nina Kaukua and her colleagues weren’t trying to solve that mystery. They were just studying certain kinds of cells in the teeth of mice. These cells, called “glial cells,” are support cells that help the nerve cells (called neurons) do their job. In their research, they were adding a fluorescent chemical to these cells and watching what happened to them over time. What they found was kind of shocking! The fact that stem cells are available inside the nerves is highly significant, and this is in no way unique for the tooth…Our results indicate that peripheral nerves, which are found basically everywhere, may function as important stem cell reserves. From such reserves, multipotent stem cells can depart from the nerves and contribute to the healing and reformation of tissues in different parts of the body. It will be very interesting to see whether or not his prediction is confirmed. If nothing else, this research indicates that we have a lot more to learn about stem cells! I think there may have been some other hints of this sort of advance in recent years. A paper out of Japan published in Science in 2010 suggested reversibility in murine spermatogonia; “Functional Hierarchy and Reversibility Within the Murine Spermatogenic Stem Cell Compartment”. More recently, Hans Clevers has published results suggesting a heterogenous stem cell pool, with stem cells playing roles determined by their stromal niche environments in the intestinal crypts. He has a very fascinating model system he calls the “confetti mouse” that lends itself to dazzling intravital observation of intestinal homeostasis and regeneration. His group detailed some of their findings in a 2014 Nature paper entitled “Intestinal crypt homeostasis revealed at single-stem-cell level by in vivo live imaging”. Certainly its a fascinating field of work right now. Thanks for those references, Grant. I will have to read them. I wonder how I missed the one in Science.